It's still the Wild West for digital marketers. Get excited. It’s Still the Wild West for Digital Marketers. Get Excited. Thanks to Dan Tynski for this contribution. Dan is a content marketing veteran, with over 7 years experience creating and promoting viral content to social audiences. He is the co-owner of Fractl, a digital agency focused on creating massively shared, high-impact content marketing campaigns for brands looking to push the envelope. As I read some of the SEO focused resources that used to give me so much inspiration, I don’t come across content that inspires me often enough. As the industry has evolved, innovative SEO focused posts are fewer and farther between. The feeling of limitless possibilities and gold-rush enthusiasm has waned. Although it’s hard to admit, it often feels as though some segments of the SEO publishing industry have become a glut of rehashed conjecture and stale, increasingly moot debate. I’ve given a lot of thought to this recently and realized that although I have these feelings about certain SEO focused content, I’ve found renewed enthusiasm and vigor in reading a slew of new marketing blogs, especially those that focus on other areas of online marketing, areas that are growing, changing, and evolving rapidly. I’m finding invigoration in the places where innovation is happening. Begin seeing SEO as a small part of your toolkit, because that is where it will soon be relegated. Or even better, stop seeing SEO as a siloed task. Start thinking of it as a byproduct of more impactful marketing work. We all need to step up our games as a students of the Internet, because things are shifting faster than ever before. If your eyes are singularly focused on what the next Google update means to you, you will fail to see that it is the Internet itself that is driving innovation, and it is the Internet as a whole that we should listen to when growing as digital marketers. If you’re going to survive and thrive in a content-focused world, you have to expand your educational horizons. Let’s open the curtains and peer into a diverse world of new and inspiring thought leadership. Just a few years ago, the results from recommended (and not-recommended) SEO techniques spoke for themselves. Those who could capitalize on little known strategies, tricks, and schemes that subverted or manipulated search engines ranking algorithms reaped tremendous benefit. It was a time when ranking for top keywords in big industries was possible without massive budgets and teams. Google’s ability to fight spam was less evolved. It was a wild west that created many millionaires and spawned an industry of me-too’s virtually overnight. It was also a time when there were few other options for successfully marketing oneself online. Search mattered most because that is where the vast majority of customers went to find what they needed. The problem here became two-fold. Google realized that they needed to stop or at least stifle many of these sorts of practices because they weren’t adding value to the Internet. They were simply ways of subverting the algorithm, and over time they would lead to SERPs becoming less relevant. Other signals, specifically social signals began emerging as relevant indicators of a site’s value within a niche. Google realized these signals clearly should be part of the algorithm. In an effort to solve these issues, Google began focusing closely on reducing SEO’s ability to manipulate the SERPS primarily by decreasing the efficacy of most of types of manipulation listed above. Over the years this has resulted in a variety of Google algorithm updates that did just this, the most recent of which were aimed at hitting sites that had large amounts of content of little value, and sites with unnatural link profiles. Many sites have been hit very hard by the Penguin and Panda updates, and have resulted in a marked shift in the Internet marketing industry. Techniques that used to be recommended, are now disavowed. SEOs are slowly realizing that Google is beginning to catch up. Manipulative tactics are on their way out, and the only way to sustainable success lies with creating real, worthwhile value that can drive links and social engagement. As SEO tactics that used to work continue to be devalued or made irrelevant by Google, the problem is compounded by the fact that search itself is no longer the only major potential source of customer acquisition. While there is no doubt that search is still the most important business driver for most online companies, there has been a marked change in recent years. Increasingly, businesses are realizing that search will only become more competitive as it simultaneously becomes a smaller piece of the customer acquisition pie. Additionally, customers are demanding more personalization, more customization, and more context. They are more discerning than ever, and are wary of being duped. In the new age of social media, users and buyers are interested in buying products and services from companies they like and feel they can trust, not simply the ones who show up at the top of the search results. Savvy companies are beginning to realize that the only real way to build trust, and create brands that are loved online is by talking to audiences in their own language, in the communities where they naturally congregate, and by learning what they need, and giving it to them. The best part? Google loves it! By creating content of real value, the signals Google now values most (natural and diverse links and social sharing signals) are simply a byproduct of creating and sharing high quality content, leading to better rankings in search without the fear of the next Google algorithm update. SEO experts and educators who illuminated the often technical and tedious intricacies of on-page optimization and non-content based link-building. Subverters and Blackhats who found new ways to game the system and manipulate Google’s algorithm to their own benefit. As a content based approach becomes increasingly more important, it is necessary also to shift those we look to for inspiration and guidance. What follows are a sampling of the types of individuals that are innovating on the content marketing side. These are the types of folks that will help shape the next generation of Internet marketers, and those that are keen enough to watch and learn from them will reap the well known benefits of all first-movers. There is a “life cycle” with new content mediums. Content presented in never before seen ways gain a type of innovation bonus whereby they are shared and interacted with at increased rates based on their novelty. Innovating on content mediums also allows for new and often better ways of allowing sharing and interaction with the content. Sometimes it even allows for higher levels of viral sharing if the medium lends itself to easy replication and remixing. Here are a few examples of new and innovative content types that we will be seeing considerably more of in the coming years. Be of interest and value to potential customers and broad audiences in a non-salesy way. 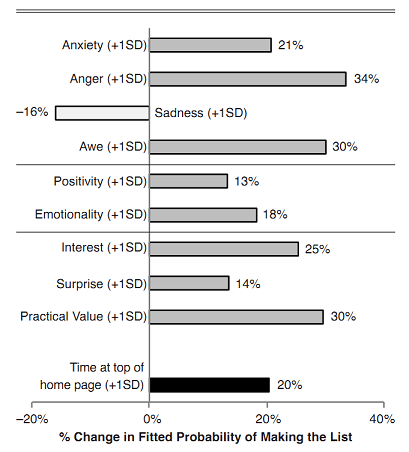 Below are the probability increases of a piece of content making it to the “most-emailed” list based on the associated categorization of the primary emotion elicited by the content. Examining content based in this as a primary criteria can help you to understand why one piece of content succeeded and one did not. Quantifying and deeply understanding what underlies and motivates interest, emotional reaction to content, and the details of what spurs sharing will provide a significant leg up over competitors. Innovative new research and tools are just now coming onto the market that will allow us to shed light on what has until this point been a very ambiguous. Roger Dooly’s Neuroscience Marketing Blog is an excellent place to begin examining the science behind how and why we are influenced by marketing and content online. Deeply understanding the intricacies of how social communities interact and share online is the key to being able to create content that successfully resonates with online audiences and garners the exposure and sharing that leads to positive brand engagement, loyalty, and advocacy. Those who study online communities and the ways they share, interact, and create content are many times the first to see new opportunities. Mike Rugnetta – Check out his PBS Idea Channel! It has some amazingly innovative thoughts on Internet Culture presented in a fun and quirky way. One of the most important qualities of successful content is that it makes complex information more easily understood and more accessible. As the content marketing space gets increasingly competitive, it will be those who are adept at this skill that will see the most success. Among the best at this are Data Visualization professionals. Now I don’t mean purveyors of the more general types of infographics out there. I mean thinkers like those over at the New York Times , who understand that we are converging on a new era in bringing information to the masses. There is a tsunami of information and data out there from a huge variety of sources. The problem is that they exists in research papers, in databases, and in long-winded governmental and industry related publications. This information, when collected, analyzed, and presented in a way that makes it easily understood to the masses provides, hands down, the BEST, and most successful content. This journalistic approach creates value where there was none before, and it does so in an innovative way. Instead of rehashing the ideas of others, this approach actually MAKES NEWS. it can become much easier to predict what new hyped up web properties will actually take off. If you want to catch the next wave of blockbuster content types, look to innovations in communication methods. For instance, the growth of Pinterest opened up the doors for the popularity of “instructographics” because they lent themselves to the format and content culture of the space by providing tidbits of information visually that many users would find USEFUL. Likewise with Tumblr, we’ve seen animated gifs and emotional reaction macros become extremely popular because they fit well with the massive micro-consumption and sharing that Tumblr enables. Look to the new upcoming channels to figure out how it will influence next generation content, then look to capitalize by innovating on that content type. As a demographic whose primary concerns include interacting socially with their peers, and developing and expressing their burgeoning new identities, teenagers and young adults are excellent diviners of what will soon become popular with the masses. They are key tastemakers because they are some of the heaviest content sharers and remixers. They are adept at all aspects of social media, and do not hesitate to try and explore new sites, tools, games, or communication mediums online. Keep an eye on what is becoming popular with the kids and you can often spot opportunity for the best ways to engage with new potential customers before anyone else. If you consider yourself an just an SEO, it is probably time to shift your perspective. Ranking well in Google has become much much more than it was in years past where typical SEO tactics alone could lead you or your clients to success. This new era requires that you become a digital content and online PR expert. By looking to new role models, you can poise yourself to take advantage of the extraordinarily fast paced evolutionary environment we find ourselves in. Success in the future won’t come from anticipating Google’s next move, it will come from anticipating what the largest audiences on the Internet care most about, and how they most like to consume information on those topics. Great read Dan. I like how you phrase that SEO should be a byproduct of creating great content and value. Then organic traffic then flows naturally as opposed to chasing the latest algo updates. Tom, thanks for the great comment. I definitely agree with you and I think “Web Presence Optimization” is a great term. Having an integrated understanding of all of the aspects you mention will be essential in creating truly effective campaigns. SEOs need to step outside their comfort zones and begin exploring and testing themselves in all of the areas you mentioned in order to keep pace. Incredibly thoughtful observations Dan, thanks for sharing. I think much of this falls into the realm of web presence optimization (WPO), of which SEO is but one component. Maximizing web visibility today requires coordinating the talents of professionals in SEO, PR, online advertising, marcom, content marketing and social media. Thoughts? Dan Tynski is a content marketing veteran, with over 7 years experience creating and promoting viral content to social audiences. He is the co-owner of Fractl, a digital agency focused on creating massively shared, high-impact content marketing campaigns for brands looking to push the envelope.